Alam Lohar Punjab Folk Music Singer. He was born on 1928 in Achh, near village in Kharian Tehsil, District Gujrat Punjab and born into a family of blacksmiths. 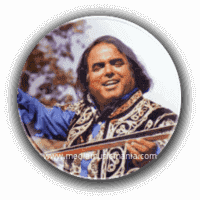 He was most popular Pakistani Classical Music, Punjab Folk Music Singer, he sung Pakistani Sufi Songs. He sung Super Hit songs in different languages such as Pubjabi, Saraiki and Urdu language. He was most famous and demanded Artist of Pakistan. Alam Lohar was best Punjabi Music Singer and he created good name in Punjab Folk Music. Alam Lohar developed a new style of singing story telling Music in the history of Punjabi Folk Music, which made him popular when he toured villages and towns in the Punjab region. He was famous for his rendition of Waris Shah's Heer along with other songs such as Sail-Ul-Malook. He recorded his first album at the age of 13 and has outsold all other singers in Pakistan at the time. In his childhood he used to read Punjabi Sufi Songs. His popular albums such as "Jugni", "Bol Mitti De Baweya", "Wajan Mariyan Bulaya", "Saif-uk-mulook", "Dil Wala Dukhra" and "Hazrat Lal Shahbaz Qalander R.A Dhamaal". Alam Lohar sung Punjabi Sufiana Kalam, Pakistan Folk Music, Pakistan Classical Music in his childhood with Punjabi stories and poetry. He recites Punjabi stories and participate as a young child in local elderly gatherings expressing a vocal only art form in reading passages of great poets. Alam Lohar breath his last in road accident near Sham Ki Bhattian on 03 July 1979. I have selected below most popular Music of Alam Lohar.